We harvested the last of this year’s yuzu fruit today. It is a neat fruit to grow in the garden because it can be used in so many different recipes and is edible when young and green all the way into the late fall when it is ripe and yellow. An extremely aromatic fruit – a basket of yuzu perfumes the whole room. And it makes an equally aromatic tea: a heady floral elixir with notes of mandarin orange, lemon, lime, and grapefruit. 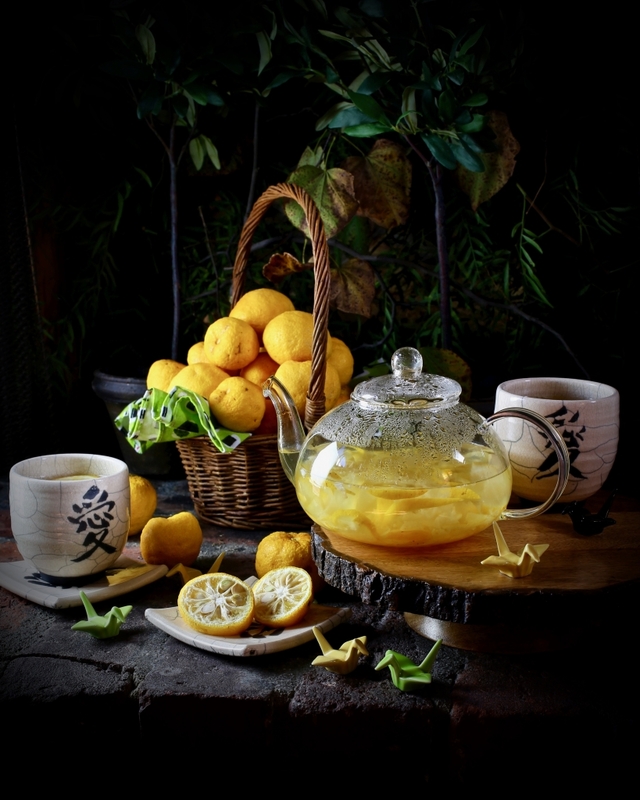 The yuzu tea recipe is quite simple. Cut the fruit in half around the equator and remove the seeds. The seeds are large and plentiful but easy to extract. I use the skinny end of a teaspoon to pop them out. 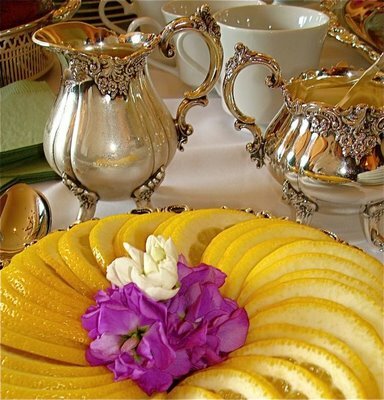 Slice the fruit into slivers. Without taking too much trouble, remove as much pith as possible. Place cut fruit in a bowl and muddle with a good amount of sugar. Once well-muddled, place the yuzu/sugar mixture in a teapot and pour in boiling (filtered) water. Steep only briefly then pour the sweet citrusy tea into mugs, along with some of the soft rinds and flesh which are edible too. 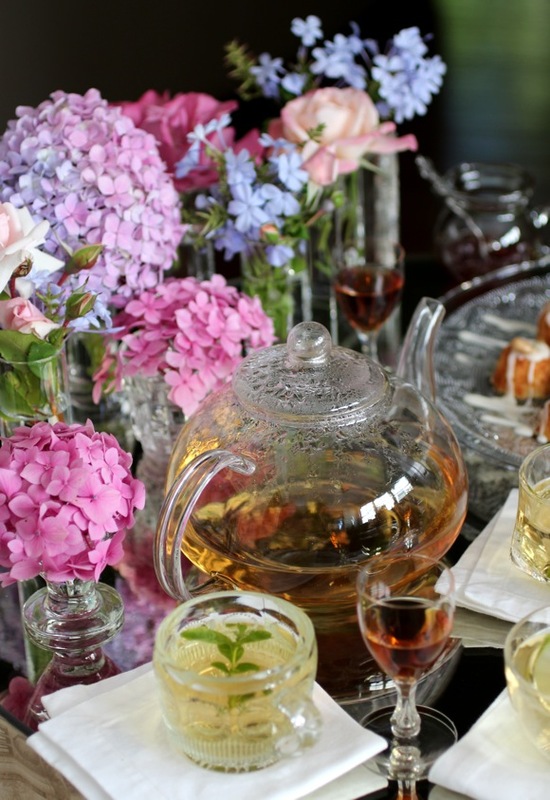 There’s a fancy tea party underway to benefit ovarian cancer research over at Foodbuzz. My talented blogger friends are busy preparing darling tea sandwiches and baking scones, crumpets, precious little cakes. So I decided to brew the tea! But not just any tea – an enchanting display tea where heart-shaped white tea leaves gently open into a blossom centered with pink amaranth and orange lily, crowned by a single perfect multi-petaled jasmine flower. 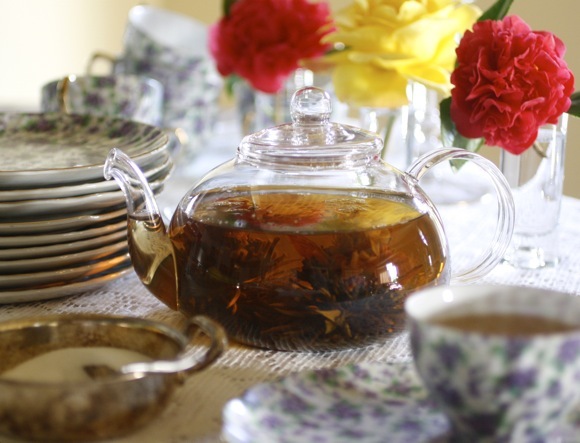 A heady tea worthy of my friends’ flair and baking expertise. 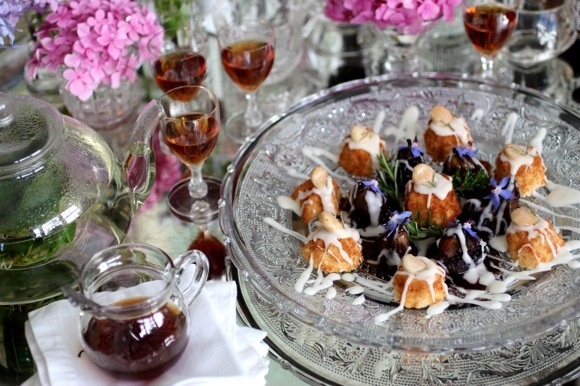 You may recall a blog post with lovely photos of an afternoon tea from last May? This is another photograph from that magical afternoon. I am submitting it (just under the wire) to the CLICK food photography event. August’s theme was CITRUS.